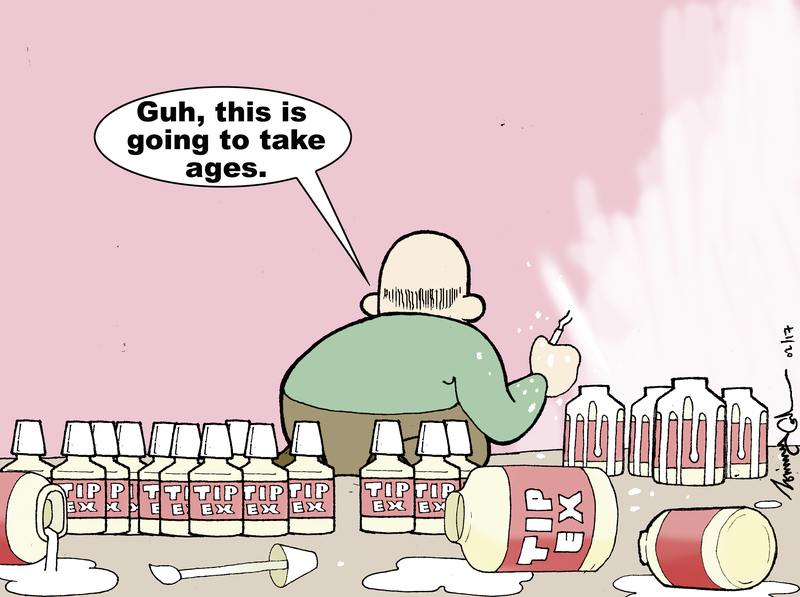 SCRAP Step 15 – Tippex Investigation. My wife, Mo started out life being trained as a secretary and developed excellent high speed touch-typing skills. However, even so, I imagine that maybe once a year she might have made a typing error, so I guess that makes her the prime suspect! As that was over 50 years ago that could explain the accumulation of four bottles of Tippex. That’s where some clutter comes from. How many more things are there from our past that are now obsolete, that we continue to cling onto ? There must be a better idea for dealing with this clutter. Any inspiring ideas ? 5 Responses to SCRAP Step 15 – Tippex Investigation. As regards tippex (and envelopes come to that) whilst John might not ever use them, I do. Or rather, I did. They’ve now all been thrown out in his eagerness to clear the office shelves. And today he’s started on sorting out books in the Study. I’ve told him to throw out as many of his own as he likes, but on pain of starting a Domestic he’s to keep his hands (and his cardboard boxes) off mine! I can’t wait for the better weather to arrive – he’ll then spend all day out in his garden. And he can ‘de-clutter’ that (and his various garden sheds) for the next few months to his heart’s content!! You will be pleased to know I am doing well with the books. I have seen shelves that haven’t seen the light of day for years 😀 I will write a blog about the books when I have finished, which could take a few more days yet. I am delighted that Gill has also started de-cluttering. I wonder if she will give away any of the things you have ask her to store for you in her garage. I will send her a copy of Walt and George’s book and perhaps that will inspire her to do more. I also hope the both of you are not out buying more clutter as I am left at home wrestling with de-cluttering. Hey Ho! Tppex, and that sweet smell of solvent, it is not the decluttering your alluding too, or Mo’s inability to type, but your own habits? Resting in a chair with a chosen book-Mo in the background giving one serious ear ache, and then that dreamy feeling as you unscrew the lid of that tippex, touch the top lip and breath in deepling? You are on your way to LA La Land? or some other entertainment arena/cinema, where one can bury ones head in the sand, and claim decluttering is all in the mind? Are you 10 pence to the shilling? do you have your marbles at home or do you play with them??? Careful how you reply, I am Seafaring ‘Wag’ and your enuendo’s drive my imagination all over the place! But Hell! you are a Nice Guy! Last night I watched BBC2 Television, and the programme ‘Hospital’, based mainly around the London district and the Hospital Care Group for St Marys, St Thomas’s, Charring cross-Hospitals (Within a radius of some 10 miles of Charing Cross its self). The cast were sicklesemia (spelling?) for a child (Under 18-19), a patience male of 92 and 87. I was full of admiration for the treatment each person received: However I was slightly concerned with the argument/point being made for the T-A-B-S procedure on the 92 year old gentleman. The costs were justified, on practical grounds-ethically the case was answered, but I am left wondering what If I were unwell, and not living in central London, (Or did not have access to London). For Instance the pre-case discussion group consisted of some 15-20 persons, and under operating conditions in the theatre another 20 odd persons. To collate all these persons and arrange a common point in time (management) can be and I suspect is very expensive, relative to the modern technology utilised (But very breath taking). As I say if I lived in central London I would be OK, but I do think I would be treated fairly, but not so equitably,? It is a Postcode Lottery??? The footnote for the treatment of 92 was if one is fit and well one receives consideration for treatment (With respect to life expectancy), if one is or has another ailment one is encouraged to allow nature and the ‘God Lord’ to take their course!!! How does one square the circle in later life??? Tippex can hide many a sin, or enable one create new ones in any form of words or sentences/paragraphs, or narrative!! So daddy what did yoiu do in the war, as the saying goes? what was your past life? Is it racing before you, in ones memories, or before ones very eyes? Have things changed for the better? As you declutter your memory banks together with the physical objaectar of the book shelves, garden shed, the man cave, and sweep things up from under the carpet? do you wonder who loves you BABE? The one room in the house you have not mentioned is the kitchen, and its fridges/ washing machines/ tumbler driers/ deep fat frier/ and that americam gizzmo the ”’—– Grill’ ?” was that not promoted by a mr Tyson once and now a retired world boxing champ? Why am I in the kitchen or scullery, well mum was there in my minds eye, making Bread and dripping/ Sugar/ or jam sandwiches? Chicken was a luxuary, liver, and mince where the staple diet, and then in season, Bilberry /blackberry and apple pies/ bread and butter pudden,.Mum could not cook or bake a yorkshire pudden: But Hey Ho! life was good. Now as one looks around and talks to the next generation, and the younger one as well, the choice of fast foods is never ending: Pizza’s/burgers/mexican tapso?/ thai curries, the list is never ending, the diet up the pole? so to speak. The choice of bread for instance is brown/white/whole meal, and french: and anything in between goes! Fish and chips still remain-But at a price and such huge portions?